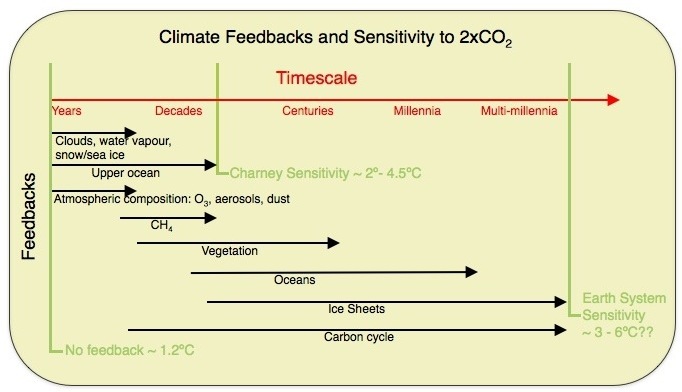 There are two recent papers on paleo constraints: the already mentioned PALAEOSENS (2012) paper which gives a good survey of existing estimates from paleo-climate and the hierarchy of different definitions of sensitivity. Their survey gives a range for the fast-feedback CS of 2.2-4.8ºC. Another new paper, taking a more explicitly Bayesian approach, from Hargreaves et al. suggests a mean 2.3°C and a 90% range of 0.5–4.0°C (with minor variations dependent on methodology). This can be compared to an earlier estimate from Köhler et al. (2010) who gave a range of 1.4-5.2ºC, with a mean value near 2.4ºC. One reason why these estimates keep getting revised is that there is a continual updating of the observational analyses that are used – as new data are included, as non-climatic factors get corrected for, and models include more processes. For instance, Köhler et al used an estimate of the cooling at the Last Glacial Maximum of 5.8±1.4ºC, but a recent update from Annan and Hargreaves and used in the Hargreaves et al estimate is 4.0±0.8ºC which would translate into a lower CS value in the Köhler et al calculation (roughly 1.1 – 3.3ºC, with a most likely value near 2.0ºC). A paper last year by Schmittner et al estimated an even smaller cooling, and consequently lower sensitivity (around 2ºC on a level comparison), but the latest estimates are more credible. Note however, that these temperature estimates are strongly dependent on still unresolved issues with different proxies – particularly in the tropics – and may change again as further information comes in. There was also a recent paper based on a climatological constraint from Fasullo and Trenberth (see Karen Shell’s commentary for more details). The basic idea is that across the CMIP3 models there was a strong correlation of mid-tropospheric humidity variations with the model sensitivity, and combined with observations of the real world variations, this gives a way to suggest which models are most realistic, and by extension, what sensitivities are more likely. This paper suggests that models with sensitivity around 4ºC did the best, though they didn’t give a formal estimation of the range of uncertainty. And then there are the recent papers examining the transient constraint. The most thorough is Aldrin et al (2012). The transient constraint has been looked at before of course, but efforts have been severely hampered by the uncertainty associated with historical forcings – particularly aerosols, though other terms are also important (see here for an older discussion of this). Aldrin et al produce a number of (explicitly Bayesian) estimates, their ‘main’ one with a range of 1.2ºC to 3.5ºC (mean 2.0ºC) which assumes exactly zero indirect aerosol effects, and possibly a more realistic sensitivity test including a small Aerosol Indirect Effect of 1.2-4.8ºC (mean 2.5ºC). They also demonstrate that there are important dependencies on the ocean heat uptake estimates as well as to the aerosol forcings. One nice thing that added was an application of their methodology to three CMIP3 GCM results, showing that their estimates 3.1, 3.6 and 3.3ºC were reasonably close to the true model sensitivities of 2.7, 3.4 and 4.1ºC. In the meantime, the ‘meta-uncertainty’ across the methods remains stubbornly high with support for both relatively low numbers around 2ºC and higher ones around 4ºC, so that is likely to remain the consensus range. It is worth adding though, that temperature trends over the next few decades are more likely to be correlated to the TCR, rather than the equilibrium sensitivity, so if one is interested in the near-term implications of this debate, the constraints on TCR are going to be more important. Of course you could be right that there’s some oscillation before it dips again, but I wouldn’t bet on it. There was nothing special about 2012 conditions to have caused a big dip (e.g. SOI index didn’t show any big El Niño events over the year).